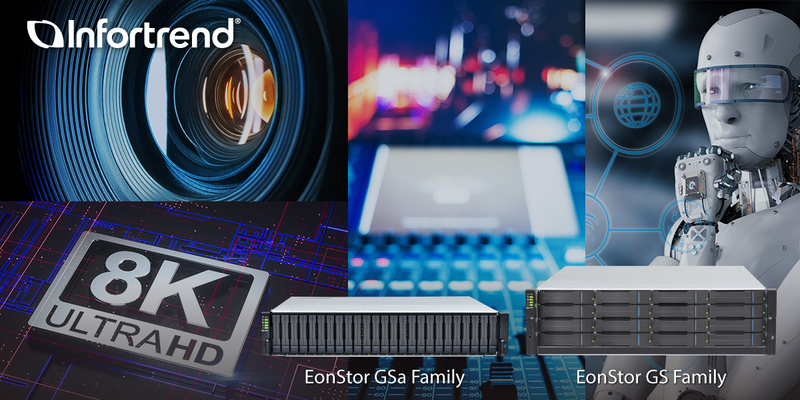 Infortrend Technology (Booth SL7624) is pushing the boundaries of workflow efficiency with a high-bandwidth 2 x 25-Gb iSCSI SAN solution along with EonStor GS Unified Storage and GSa AFA (All-Flash Array). At the show, the company is demonstrating this turnkey solution with ATTO Technology for today’s demanding media-collaboration environments. 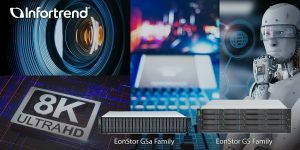 With the proliferation of HD production and delivery formats, such as 8K and beyond, media-storage systems not only require unprecedented IOPs performance and also demands a faster and efficient I/O to exchange data across networks. A single 25GbE lane offers 2.5X bandwidth and is backward-compatible with 10GbE. With two 25-Gbps Ethernet ports per host board, Infortrend storage offers M&E customers a high bandwidth over Ethernet networks. In terms of system configuration, a dual-controller GS 3000 system can support up to eight 25-Gbps Ethernet ports with two host boards per controller.